NEW Kenneth Cole Reaction Men's Urban Heather Slim Fit Flat Front Dress Pant N..
Urban heather modern fit flat front dress pant. Slim-fit dress pant with flat front featuring low-rise waist and off-seam front pockets. With our dynamic pricing model, our prices are always competitive. Accentuate your nine-to-five style with these dress pants from Kenneth Cole Reaction, detailed with a finished hem and flat front for a sharp, sophisticated look. Machine wash. Side seam pockets; single besom hip pockets with buttons. 4-way stretch solid gab slim fit flat front dress pant. Rise (crotch to top of pants front): 10 3/4". Inseam (crotch to end of pants cuff): 30". Waist (across the top edge): 34". They are super light weight and breathable. Perfect combination of style and comfort. See photos for details. You are purchasing Kenneth Cole Reaction Navy Blue Micro Pin Striped Flat Front Dress Pants 34x32 Measurements are shown within photos. Product color may slightly vary due to photographic lighting sources or your monitor settings. 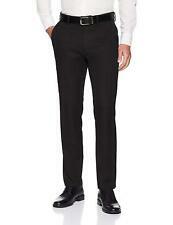 NWOT Kenneth Cole Reaction Dress Pants. Charcoal Gray and Black Mix Check. Size 34 X 34. Rise 11 1/2". Inseam 34". Size : 34x30. Color : Taupe Micro Windowpane. Fit : Classic Fit. BLACK PINSTRIPED DRESS PANTS. KENNETH COLE. 32" INSEAM. 9" LEG OPENING. One quick ironing and these pants will look great again! 34% viscose. Check out our other shirts and clothing accessories for sale! Warehouse id: #020. Size Type: Regular Inseam: 32 Style: Casual Pants Material: Rayon Stretch: YES. Waist flat across back (with natural front dip): 17. We want your item to fit great. Like New, Excellent, Very Good, Good, Fair, Poor/for Useful Parts. flat leg opening: 9. thigh across: 13. KENNETH COLE REACTION. 100% Polyester. Hook & Button Closure. One quick ironing and these pants will look great again! Check out our other shirts and clothing accessories for sale! Size : 34x30. Color : Solid Gray. Fit : Classic Fit. KENETH COLE REACTION. 96% Polyester. Flat Front. Button Through Back Pockets. Wool blend fabric. A great pair of dress pants for a great price! Perfect for the office or a nice night out. Size: 34 x 30. Dry clean only. Color: Black. 100% Authentic Kenneth Cole Reaction. Style: Dress - Flat Front. Size Type: Regular. Good Condition- Originally part of two piece set, missing an item. Missing blazer. Overall great deal! U:|Style:MNSDSGNRSTTRSRMSMATE|Rep:|schart:yes|Minutes:3|Am. This is a Kenneth Cole REACTION slim fit suit separate blazer that has a matching pant and vest to complete the set. Let us prove it to you. Dry Clean Only. Let us give you theVIP Service you deserve online such as. Kenneth Cole Reaction Men's Gray Dress Pants 34 x 32. Good condition as shown in the pictures. Let me know if you have any questions. Thanks for looking! Length from waist to bottom - 38". Rise - 10 3/4". 66% Polyester, 32% Rayon, 2% Spandex. Machine Wash. Flat front. KENNETH COLE REACTION. 100% Polyester. Button Through Back Pockets. Hook & Button Closure. Size Type: Regular Inseam: 34 Style: Dress - Flat Front Material: 100% Polyester. Kenneth Cole Reaction men’s pants. New with tags. Brown. 34 w x 34 l.
We bring the joy of quality and luxury at cheaper prices into your hands. WAIST (LAYING FLAT FROM LEFT TO RIGHT) 16 1/4". Brand new pants. Soft cotton, dress up or down. Sz 34x32 (Fit like 32x32). Kenneth Cole Reaction. Wool Blend. Machine Washable.